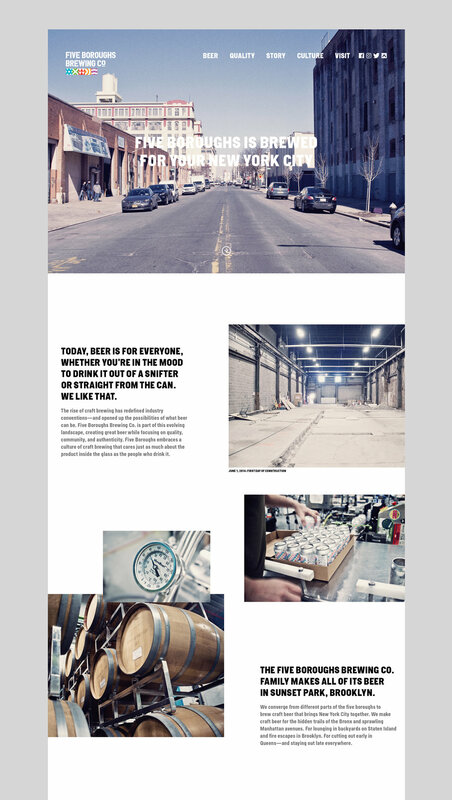 Five Boroughs Brewing Co. in Brooklyn is part of the evolving landscape of craft brewing, which is redefining industry conventions and opening up the possibilities of what beer can be. We create great craft beer while focusing on quality, community, and authenticity. Converging from different parts of the five boroughs, we come together each day to brew craft beer that unites New York City. Five Boroughs makes craft beer for the hidden trails of the Bronx and sprawling Manhattan avenues. For lounging in backyards on Staten Island and fire escapes in Brooklyn. For cutting out early in Queens—and staying out late everywhere. The greatest city in the world is filled with infinite possibilities, both familiar and undiscovered. And everyone needs a craft beer to bring along on their adventure. One-off and collaboration styles are brewed on the regular, these are some of those labels. The launch of a new website, with new creative direction and content that reflected the inclusive feel of the brand was essential. The website focuses on rich imagery and branded details, while providing information of the brewery.